Instead of creating jack-o'-lanterns for autumn, jazz up those pumpkins with glitter for a kid-friendly alternative to carving. 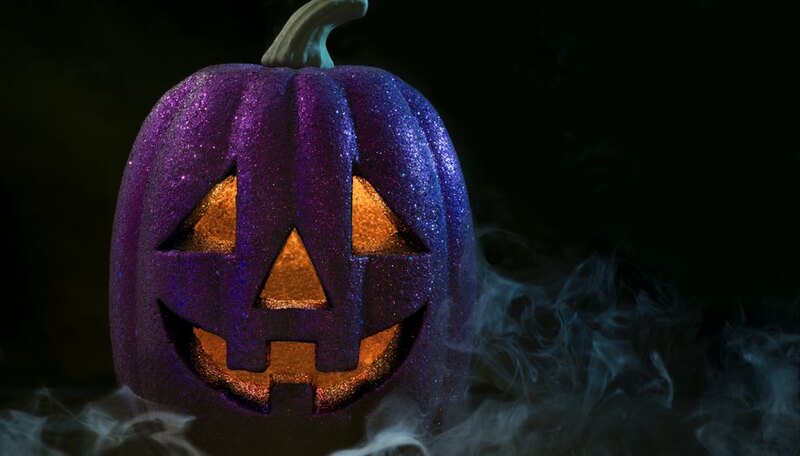 Glitter can be used to create all sorts of looks or designs on both real and foam pumpkins, or pair the glitter with paints for even more creative freedom. If working with young children, do the glittering outdoors on a non-windy day, ideally, to keep the mess to a minimum. Even if you're working outside, cover the work area with newspaper to help contain the glitter. If you're using real pumpkins, wipe them off thoroughly -- including the stems -- with damp paper towels. Brush off large chunks of dirt first, outdoors. On both real and foam pumpkins, remove stickers and wipe those that were stickered with a damp paper towel to remove adhesive residue. Protect your project area by covering it with sheets of newspaper; then set your pumpkins atop it. Set up all your supplies -- including several colors of glitter, white glue, foam brushes and craft brushes -- atop the paper. Keep scrap paper and pens on hand to sketch out basic ideas before creating them on the pumpkins. A paint cup full of water allows you to rinse out the brushes after use. A foam plate serves as a holder for the glue. Create designs such as words, faces or patterns on the pumpkin by painting the desired design with glue first. Squirt a pool of glue onto a foam plate; then dip an artist's brush or any inexpensive craft brush into the glue. Paint the design, such as your name, on the pumpkin with the glue, dipping the brush back into the glue as needed. The more glue used, the more glitter will stick to the pumpkin. Use enough glue for a moderately thick layer, but not so much that it drips. Sprinkle a generous amount of glitter into the wet glue design, positioning the pumpkin so the glue faces up. Shake the pumpkin off atop the paper; then sprinkle more glitter into the glue, as needed. Only apply glue to one area at a time, or for one color of glitter at a time. Allow the glue to dry before creating a glue design for a second color of glitter, unless the design is far enough away from the first that you can do so without mixing the glitter colors in the wet glue. Allow the pumpkin to dry before handling the glittered areas. Painter's tape can be used to create glitter patterns on pumpkins, much the way it comes in handy when creating borders for paint. Plot out designs such as stripes or chevrons with strips of painter's tape, smoothed down over the pumpkin surface. Apply a layer of glue between the tape strips using a foam brush; then sprinkle a large amount of glitter over the wet glue, shaking off excess glitter and applying more, as needed. Re-use the glitter that falls to the paper by folding the paper to create a channel for the glitter, pouring it back into the container or into an empty disposable cup. The tape also comes in handy for masking off the area beneath the stem, if you're coating the stem in glitter. Cover the entire top of the pumpkin with tape -- other than the stem -- then brush the stem with glue. Hold the pumpkin at an angle and sprinkle glitter over the stem, rotating the pumpkin to ensure coverage over the entire stem. Glam out your pumpkin by painting it black, silver or gold first, using acrylic craft paints or spray paint. If you're spray painting, work outdoors or in a well-ventilated area to avoid breathing in fumes. Once the paint dries, embellish the pumpkin's natural ridges with stripes of glue and glitter, or coat it with swirls, dots or vines. Let children paint designs such as ghosts, bats or tombstones on pumpkins using acrylic paints, washable craft paints or paint pens. Outline the designs in glitter by tracing the images with a thin line of brushed-on glue, then shaking glitter over the wet glue. Glitter may also be sprinkled directly into wet paint for a slightly sparkly effect.